When I moved to the midwest I was introduced to Crock Pot cooking. I had never even seen a slow cooker before and had no idea the range of foods that could be created in a plug-in cooking pot. Since then I have had everything from No-Peek-Chicken, Swedish Meatballs and Peach cobbler, done in one of these magic devices. When my husband was an art director Aveda they had “crock pot parties,” which meant everyone plugged in their slow cookers at their desks and made a dish to share. Brilliant! Maybe kids should bring crock pots to school and have healthy food cooking at their desks. Form the dough into a ball and place it on a sheet of parchment paper. Lower the dough into the Crock-Pot (Slow Cooker), mine is a 4-quart, but I think it will work in any size. Update: I just mixed up a fresh batch of ABin5 Peasant Bread Dough, let it rise for the two hours in the bucket, then formed a 1-pound loaf and stuck it in the crock pot. So, you can use fresh or refrigerated dough. Bake for 1 hour (this will depend on your crock pot, you may need to increase or decrease the time. If you are using a 100% whole grain dough, you may want to go for a bit longer as well). You will have a fully baked loaf of bread, but the crust is very soft, almost like a steamed bun. To check for doneness I poked the top of the loaf and it felt firm. Before it is fully baked it felt soft and almost mushy when I gently pressed the top. Stick the bread under the broiler for 5 minutes or until it is the color you like, with the rack positioned in the middle of the oven. Let the loaf cool completely before slicing. Cutting into a hot loaf is tempting, but it may seem gummy and under-baked. It is fantastic with butter or as a sandwich. I love this method! *Check with your crock-pot’s manufacturer before trying this, since some model’s instructions specify that the pot has to be at least partially filled with liquid to avoid safety or durability problems. And never bake in a crock-pot unattended. This is very cool. I’m going to try this, so I don’t have to use my oven during the hot summer days. I noticed that you didn’t slash the top of the bread? With no oven spring you prob do not need to slash it. The oven spring was so gradual that I didn’t have any cracking. Wow, brilliant! Can’t wait to try this! I have a crockpot but have hardly used it. Do you think this would work with your gluten free bread varieties in your “Healthy Bread in 5 Minutes” book? I love the idea of having it rise and bake without having to move it in between, it will preserve the texture better I think. I wondered the exact same thing about gluten free breads. We have to go gluten free (and dairy free) here. I just whipped up a batch of gluten-free dough and will try it in the crock pot tomorrow! I made up a King Arthur gluten free bread mix – with a few changes. I subbed almond milk for the water and added 1 cup of the ancient grains blend to the mix and an extra 1/2 cup of egg beaters to allow for the extra flour. I greased the Rival Cake ‘n Bake pan with olive oil all around the sides & bottom, put the dough in and the vented lid on, then put all into the covered crock. At two hours I checked it at the center with a thin knife and it was still a bit sticky so I let it go another hour – time in the recipe booklet said 2.5-3.5 hours – and then the knife came out clean.I pulled it out and set it on a rack to cool for 1/2 hour, then ran a spatula all around the sides to loosen it up in case it was stuck. The sides were nice and crispy and one spot on the bottom stuck so next time I will use the parchment paper as a liner.The flavor was mild on the small piece I tried but it might develop more by tomorrow. I think next time I am going to try a Bob’s Red Mill Cinnamon Raisin mix as I have a feeling this will be a perfect way to bake it. 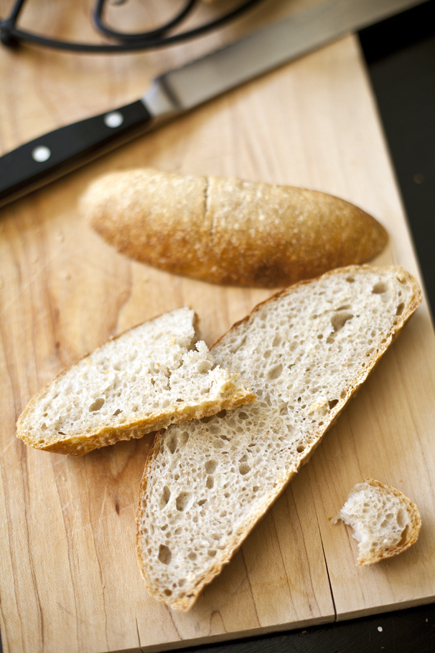 You can also try the gluten-free crusty boule from our book Healthy Bread in Five Minutes a Day. Do you put the dough in the crockpot immediately after mixing or is this previously made dough that’s in the refrigerator? Are you kidding me?!? How cool is that? I’m going to try it today. I like that I can do this without the 90 minute rest period. I hope this can be done with the Master Recipe in HBI5 (that’s what’s in my fridge right now) or any of the other recipes that bake the same as the Master…? Thanks so much for figuring this out and sharing! I am always so sad when summer comes, I do not use my oven for the entire season. I have cooked this bread on the grill in my cast iron dutch oven, and it works great. But to also use my crock-pot? Are you kidding me??? I can’t wait to try it. I am a huge fan of your breads and I love that you’ve shared with us how to make the bread in a slow cooker. It’s fantastic to be able to enjoy your wonderful breads in the summertime without having to turn your oven on. Thank you for sharing! This assumes an electric oven with the broiler at the top. I have a gas range with the broiler at the bottom and not nearly enough space for a loaf of bread between the (not very clean broiler pan–I rent) and the flame. Do you have other suggestions for getting a firmer crust? I think you can still use your broiler, just place the loaf upside down. It is worth a try and let me know how it goes! You could also put your oven on to the highest setting and let the loaf brown as the oven heats up. If another solution comes to me I will let you know. Will this method work for buttermilk bread? So cool! Now I will have to buy a crockpot! Go to your local Goodwill. They always have a few. Does the bread have much oven spring? You can see from the picture that I got quite a bit of oven spring on this loaf. If you are using a 100% whole grain dough or an older dough (past 5 days) you may get less. What a great idea! I live in the HOT central valley of California where the oven rarely gets turned on in summer months. I’ve actually thought of putting the bread stone outside with dough on it to see if it would bake! I need a recipe for the bread dough. Laura: It’s contained by the cooking vessel, not absolutely necc. I have the Rival insert with the ventilated top & I was wondering -if I oiled it to keep the dough from sticking – would that work? I also would be baking gluten free & can use a mix like King Arthur for the first try until I see how it comes out. The dough from the bread mixes is a lot looser than regular dough and I don’t think it would hold its shape as well if just put in the crock like you have shown. I think it may work with the gluten-free dough, I was going to mix up a batch from our Healthy Bread Book and give it a go. It is much easier to maneuver the loaf in and out of the crock pot if you use parchment, and it guarantees that it won’t stick to the bottom. I would leave the vent shut, so that you are trapping all the hot air, like an oven. You can open the vent for a second towards the end of baking, to let out the steam. The vented insert – called a Bread ‘n Cake Bake pan – fits inside the liner and from the directions in the book I bought at the same time, the glass lid is still used over that. The white bread recipe in Crock Pot Slow Cooker Cuisine by Rival says to put it on High for 2-3 hours until edges are browned. With the outer lid on I imagine the steam vents allow the moisture to escape into the outer liner but keeps the bread from becoming too dry like misting French bread during baking. My slow cooker is over 20 years old and about 4.5 qt but the insert says it will fit 3.5-5 qt pans. I bought it from Rival about 10 years ago with several slow cooker books but the Cuisine one has the most bread and cake recipes to work from.It will be interesting to see what differences there are between using the King Arthur bread mix in my bread machine and the crock pot – rise times/kneading vs straight up baking at a slower rate. My crock is about 185 degrees on low and around 235 degrees on high as I had checked it some time back with water to see if I could pasteurize milk with it. Either way sure beats turning on an oven in a heat wave! That Bread’n Cake Bake pan sounds like a great thing to play with. Getting a crisper crust was the only missing element to the bread. Wow, I would have never thought you could make bread in a crock pot! I’ve been trying to adjust other recipes a lot lately to make in the crock pot, but bread never crossed my mind! I can’t wait to try this! Seems like the trapped moisture would help create a nice, crisp crust, and I love that the rising and baking happen in the same step. Because the moisture is trapped during the entire baking, it actually makes for a softer crust, so you’ll want to do the broiler trick at the end to get a crisp crust! What makes this method superior to using the oven? Not superior, just another option and one that is great for those summer days when turning on the oven doesn’t appeal to you. OH OH! This is next on the list. I’m definitely going to link my blog readers to this post. YUMMMMM! We just purchased our first Crock pot slow cooker this weekend and right away we thought your breads would do well in it. Was going to figure this out – but now – you have done the work for us. Thank you very much!!!! We have all of your books and bake most of our own breads now. It would be interesting to make a pizza in the slow cooker as well. Will have to try this…………. Oh boy, pizza in the slow cooker is quite a challenge! 😉 Please let me know if you develop a recipe for us to try. It is called Perfect Pizza from your slow cooker and is in location 3191 in my kindle Fire from the book The Vegan Slow Cooker by Kathy Hester. I have not tried it out yet – but thought you might be interested. She uses a Focaccia dough which is also in the book. I purchased 3 slow cooker cookbooks this weekend after bringing home our new Crock Pot. Have used the pot for so many meals and it is so exciting. Especially on that really hot 90 degree day (I am also in Mpls.) This summer is going to shape up a lot better being able to have bread as well – we usually wait for a cool day to bake our breads – or to make hot meals. Being vegetarian in no way limits the various things we can make in a slow cooker – I had always thought of it for cuts of meat – but the recipes I have found – blow me away!! So very excited to try all of these new things…..
Hey – any thought on a slow cooker bread and dessert book???????? If anyone can do it – you and Jeff could……. I hope you will report back when you try the pizza recipe! I can’t wait to get back home and try this one!!!! I was hopeful, but my first attempt’s crust was downright tough! Ideas?! I’d love to be able to use my corckpot instead of my oven! Thank you for trying it out already! Was it the bottom crust that was tough? If so, your crock pot may get much hotter than mine, so you’ll want to turn down the temperature! Try that and let me know! Wow. This completely blows my mind! I had no idea you could make bread in a crock pot. I will have to try this! I am pinning it too! After one hour my dough was still pretty raw. When you poke the top did it feel like it resisted or did it still feel a bit soft? What dough were you using? Sounds like you just need to let it go a bit more. It may take a couple of loaves to figure out the proper timing with your particular crock pot! Did you let the loaf cool before you ate it? A hot loaf will be gummy, which makes it seem under-baked or raw. Never would have thought of that Zoe! Love it and I’m totally going to try this asap! This is simply brilliant! I do have a slow cooker and it hasn’t been used more than once..I think it is time to make a use of it. Thanks a lot 🙂 Really appreciate it. I have seen bread cooked in a crockpot, but didn’t know if it would work with your dough. So excited to try this. I live in Las Vegas where it’s just plain crazy to turn on your oven in the summer. I definitely use my crockpot a lot more. Also, I got a solar oven so I could still bake this summer. I need to figure out how to cook your dough in my solar oven. I wonder if it would be similiar to cooking in the crockpot because I can only get my solar oven up to 300-350 degrees. Thanks for posting this! Samantha: Interesting re: solar oven, I’m curious how you make out. Will be a soft-crusted bread and will take more time. This seems like a terrific idea! However, I only have a 1.5 qt crock pot. Would it still work, or would I have to use less dough….? Shelb: Question is what will happen if the dough spreads sideways onto the pot’s walls, don’t know if maybe it will stick (unlike the Dutch-oven method, where it’s hot enough so that it quickly crisps and releases from it if it touches the walls). If sticking’s a concern, then yes, you’ll have to make smaller one. I tried it this morning with mixed results. It’s still cooling so I haven’t been able to cut into it for a final analysis. I started with a light wheat recipe (3 days old), 1 pound ball (weighed it) and my Hamilton Beach 6-cup oval slow cooker. Checked it after an hour and had amazing spread and very little spring. The top was still mushy to the touch so I let it go another hour. Popped it under the broiler for a bit to firm it up some more, but the loaf still feels very dense. I think that the oval pot is too big for this technique — and that’s why I had so much spread and why it took longer to cook — not enough concentrated heat. I’m going to give it another go with my round crock pot and will let you know. 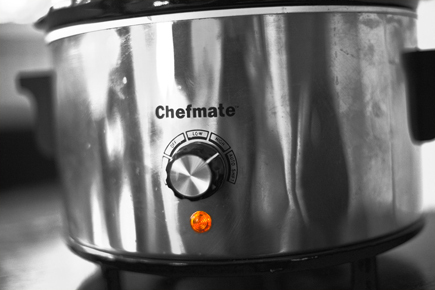 Just an FYI – Crock pots vary in temperature based on age, model and type. Older pots, circa 70s and 80s, had lower temperature settings. Today’s crock pots cook at a much higher temperature (many of them have ‘High’ settings that are 200+ degrees). If you have one of the older cookers, you might have issues. This has been a fun experiment! Looking forward to working with it some more. Thank you so much for trying this and reporting your feedback! I do suspect the machines have different heat settings, which will make a big difference. I may borrow my neighbors 6-quart cooker to try out. Thanks for giving it a try, and I like your method of crisping the top! Thank you for letting us know, I am so pleased it worked for you too. Oh, this looks too easy to be true, but I’m going to try it with my own recipe for wheat bread (took me years to get it right). Thank you so much for sharing this! I live in a hot climate and don’t use the indoor oven all spring-summer-fall so we don’t compete with the a/c. I bought a countertop convection oven which I use outdoors to bake all year long. The Lodge 3qt enameled cast iron Dutch oven just fits and lets us happily bake your breads all year long. I also use an induction cooktop in my “outdoor kitchen”. Both items sit next to my BBQ on a table with lots of prep room. When it gets too hot, I just flop in the pool. Fantastic! I cannot wait to try this! Thank you! Im planning on trying this. My question is will any bread recipe work? I usually make my bread from a recipe totally from scratch! I only have 2 6 qt crockpots, one oval and one round. Will it work or spread out to much. I assume it’s best to use the round one? Thanks! Jennifer: Go with the round, less air space– the steam will be more concentrated. I did this yesterday with a fresh batch from the master recipe. The broiler gave it just the right finish. We had it with spaghetti. We just tore off chunks and dipped it in olive oil with crushed red pepper and garlic. My 19 month old daughter would have probably eaten the whole loaf if I let her. So glad you tried it and you and your family enjoyed the loaf! I have been baking bread (often way too much) for about a decade and frankly I never would have thought to do it in a crock pot. You should receive a culinary award for even thinking this up. I am in awe. This is great! Just made 2 loaves of whole grain rye bread, which I had mixed up last weekend, using the slow cooker. Worked really well, a lovely moist loaf, it took considerably more than 1 hour, maybe one and a half, and I then browned them under the broiler, also I placed the dough into a well buttered bowl and then put it in the cooker, this prevented it from spreading too far. Thanks for another awesome tip, just in time for summer! Thank you so much for trying it and letting us know! Glad it worked for you too! #2 let fresh dough rise & then bake in the pot. Yes, you’ve got it just right! The fresh dough was a bit lighter, but just a little bit. The refrigerated dough had better flavor. 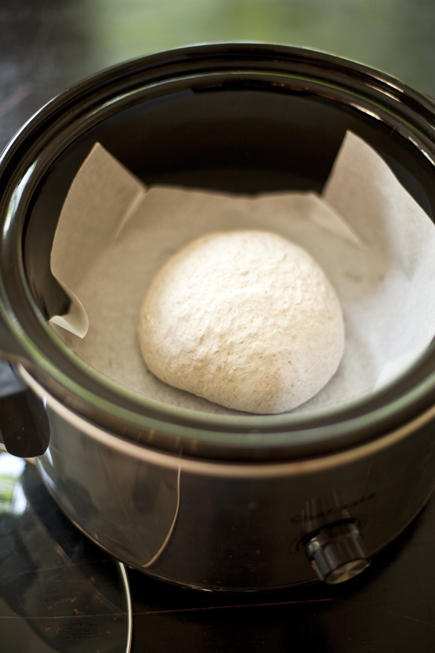 I usually dont bake bread in the oven-But I really want to try it in the crockpot! I like the fact that you dont have to heat up the house! So, to clarify, fresh mixed dough cannot be used, it must have a rise first? Also, instead of making up a dough, when I’m feeling lazy, can I use one of those refrigerated dough balls you get at the supermarket? Straight from the package and straight from the fridge? Yes, you have to let it do its initial rise and then bake it in the crock pot. I haven’t tried this method with any dough but the ones from our books, so you’ll have to experiment. Over baking it will probably result in a tough bottom crust. How long that will take depends on the crock pot, some run hotter than others. I just had another thought. Since the bread is being baked in the slow cooker, and all moisture is retained in the cooker, can you over-bake the bread? And, if so, how long would that take? Where I am, we don’t use crock-pots – we have instead modified rice-cookers which have settings for low simmer (as in to make stews/soups). Do you think it would get hot enough to work that way? I can’t wait to try this. Please let us know if the rice cooker works! Just in case anyone wants to do it, it works. I used a little electic steamer, rounded a small fist-sized piece of dough and placed it in a shallow 4″ silicone form and let it sit out for 90 minutes, then stuck it in the steamer. It rose double the amount that the dough rose in the crock pot (same dough batch, same dough amount) and was moist and slightly sticky–just like if you get the steamed buns. Since the dough won’t color in a steamer, after an hour I stuck a thermometer in it–it was 200F, so it was done. It was probably done before that, but it’ll take another round of baking to find out. I used the basic boule dough from the original cookbook (pg 26). Next time I’ll make up a filling (like the pork one listed in the first book or a red bean paste) and wrap the dough around that before steaming. Wow, that was fast! Thanks for trying it and getting back to us. Yes, and the recipe is going into our next book! 😉 we’ll post about it as soon as we perfect the method! Oh, and can I ask the topic of the new book? International breads? Thank you for trying it, so glad it worked!